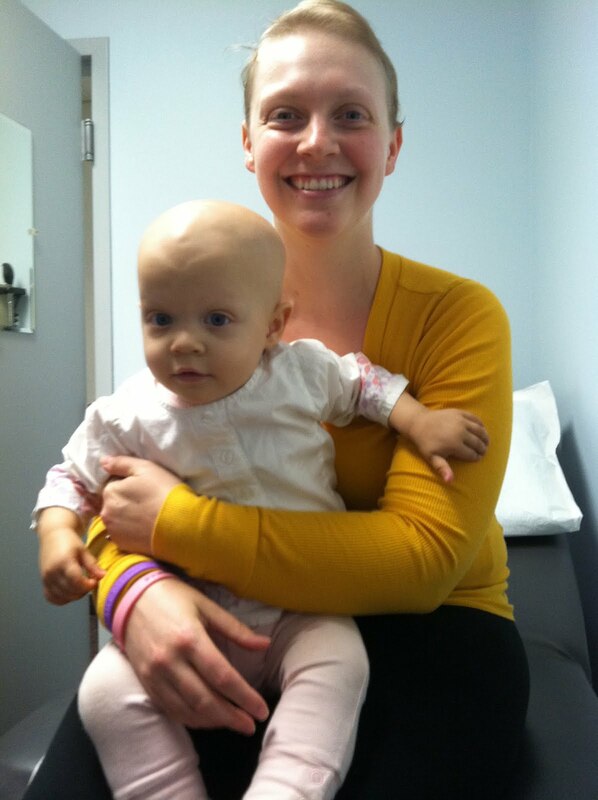 Saoirse Craig Fitzgerald lost he battle with Neuroblastoma on Monday morning, December 13, 2011. She fought for almost 8, long months, fighting back harder and more vigorously each time she had a setback. In the end, her little body couldn't take the strain, and she was too tired to keep working so hard. For now, I will hold back, as I don't feel ready to discuss her final days. But I will say that, as hard as she fought and as much as she wanted to keep going, she knew that she was too tired and she just wanted to sleep. We are holding a memorial service to celebrate her bright life, and invite you all to join us in celebrating her courage and spirit. Today, Saturday December 17th, we will gather at Cuffe-McGinn funeral home at 157 Maple Street in Lynn, MA at 5 pm. Please celebrate her bright personality by wearing bright colors and miss matched socks. We will be sharing her love of life and her infectious laughter, and remembering her courage. deepest, deepest sympathies to your family. I have been checking your blog daily since I learned of your and Saoirse's story on CNN. I have no words that can comfort you but I wanted to let you know that your story of courage,strength and beauty is far reaching. I wish you peace. I am so sorry !! All my love to your family!!!!! so sorry to hear about Saoirse, I've been following your blog for a while and she sounded like a great little girl. I lost my baby sister to brain cancer 2 weeks ago and am so sorry for your loss. Kezia, I put something like this on your FB site, but can't imagine that you would have the strength to look at it all. I hope that one day, when you are able, you can look at all of the comments and find some comfort. My heart goes out to you, your strength for your beautiful little girl was the most amazing and profound thing I have ever witnessed. Mike and Kezia, my heart breaks for you. I know that there is nothing anyone can say or do that will ease the wrenching pain you are feeling. Your beautiful baby girl was such an amazing little trooper and what happened to her, and you, this year is the worst of tragedies. You did everything humanly possible to save her. Never regret the fight-you were living an impossible nightmare, she wanted to stay, and there was still a chance and you had to try, for her. I don't believe in conventional heaven and hell. I believe that when we pass, our spirit exists in a sort of a dream state--when we were at our happiest and with those we loved the most. I believe that we are completely unaware that we are no longer physically 'alive' or that time doesn't really pass. In my belief, Saoirse is unaware of what has happened--your sweet baby girl truly is at her happiest as in her spirit she has you with her, playing with her and taking care of her, and she is not sick. Her beautiful dream will last forever--she will be with you and happy in your love forever. She is still with you and I hope you can feel her sometimes. The pain and the challenge, I know, is for those physically left behind, to survive and live on. Allow yourself time, cry, rage, talk and cry some more. Breath, though I know thats hard. And take care of yourself because nothing good can come from beating youself up, which can take many forms. When you can breath again (though I know that seems impossible now), I hope you can both find some purpose in all of this, impossible though that is,--it is a key to survival. Susan G. Komen's sister started the Susan G Komen Foundation for Breast Cancer (Run for the Cure) after Susan passed, to give her some purpose in Susan's passing. Perhaps it will be time for this world to put an end to horrors like what you and Saoirse have been through and similarily raise billions through something like the 'Saoirse Craig Fitzgerald Foundation for Childhood Cancer', particularily neuroblastoma. It might be fitting--she is just the strongest and most special of little girls. But, for now, hug her stuffies, smell her clothes, hold onto each other, hug Fallon, visit the good memories as best you can and reach out as much as you need to. Allow youselves time. When you are ready to talk, and whatever you decide to do in her honor in the future, we will be there to support you and work with you. This cancer is a monster...it is so unfair that our sweet innocent children had to go to war with something of this magnitude. I am so sorry for the loss of your beautiful little girl. My heart breaks today :( She is so beautiful, and she has touched so many all over country. May you find peace in her spirit as she surrounds you. I am so incredibly sorry for the loss of your beautiful, bright, baby girl. As the mother of two young girls, I can't imagine the pain you must be feeling. Your daughter and your story have touched so many people, and we are thinking of you and wishing you peace. I am so utterly sad to read your news of Saoirse. I have been following your family's story and was very impressed by the strength you all showed in dealing with all the ups and downs. I will be thinking of you all during this time of reflecting on Saoirse's vibrant life. My heart breaks for you as I read the news. While I'm far away I'm wearing bright green & red to celebrate S's life! HUGS and prayers for you all. Kezia, I am so sorry to hear that Saoirse lost her battle. She was a beautiful little girl. You were so strong for her and she was strong for you. She is your angel now and will forever live in your heart and the hearts of the people you shared her story with. I have been checking your blog hoping to hear for better news and I am so sad that Saoirse is gone, but she will never be forgetten. Hang in there. Love and prayers are being sent your way. my heart breaks for you ! so sorry to hear of you lost. may god lift you up and wrap his arms around you and your husband and help you heal!! I am so very sorry for your loss. Saoirse is a beautiful little girl with such wisdom at a very young age. May God comfort and bless you and your family at this time. I have been following your blog after reading about your story on CNN. I know that no words can suffice, but I am terribly sorry that Saiorse has left your arms and this world. She will be remembered by everyone she has touched and through this blog you've created. I'll keep you and your family in my prayers. im so sorry for your loss i wore bright pink today for Saiorse and crazy socks.she was a beautiful little girl. mike and kezia im so sorry for your loss me and my five year old have been following your story and he was quite upset when i told him about saiorse.later on that night when i was getting him ready for bed he told me that he thinks saiorse is up in heaven playing with dogs and cats and other little kids and probably eating candy.she was a beautiful little girl who touched so many lives. the blogs you both created were so touching and i just want to say thank you for giving everybody a chance to learn about saiorse. I am so sorry. Words cannot express the sorrow I feel for you. I have 3 children, the youngest 19 months old, and cannot imagine what you have been through. Your baby girl has touched me so profoundly. She was such a brave girl. You will be in my thoughts. So sorry to hear about your loss. I am just going through ur posts and am really amazed as to how much stress u must have undergone for the last year or so, with so much courage. You and ur little one are truly an inspiration to people who complain about silly things in life. I will keep u in my prayers to give you and Mike, strength at this time of grief. I do not know your family personally, but I have been following your story since it ran on the CHB Blog, Thriving. I am so sorry for the death of your beautiful little girl. Throughout all of her care, it was clear, above all else, that she was loved tremendously. You and your husband did an excellent job parenting this very special little girl. Please know that you will be in the thoughts of so many people whose lives you've touched through your words and through your daughter's life. Love n Prayers for you thru this trying time! Just know how much Happier and pain free she is now! Shes smiling down on you and would not want you to be sad! I doubt there is much anyone can say at this time to help ease the pain and heartbreak you and your family feels. Just know that your family's courage a strength through this tragedy touched our family profoundly. You are in our thoughts. I have been following your story and blog for a few months now, and I'm devastated to hear this news. Your daughter has touched so many hearts, and I have shed a tear for her and you today. God bless you as you move through this difficult time. I pray he holds you close. Sweet dreams beautiful baby. I am so sorry for your loss. Such a beautiful life. You are in my thoughts and prayers! I am so deeply sorry. So deeply sorry with tears streaming down my face for a little girl that I never knew, other than in the words you wrote about her. Unfortunately another little angel passed on that same day at 6:40 in the morning. The only comfort I have right now is that Saoirse and Khloe are in Heaven, running, jumping, playing and having fun, pain free. I am so sorry. I know there are no words that I can say that will take the hurt away, but just please know, that she has deeply touched a family in Iowa. I'm so sorry. Hugs. I am so very sorry to hear about your loss. Like many others here, I have been following you blog for months, checking in daily to see how you and your little girl were doing. I am so saddened by the news, and I just wish you and your family peace, love, and calm at this time. praying for you all. Your strength and courage are a true inspiration. I am so sorry for your loss. The pain you and your husband must be feeling is tremendous. I will hold the both of you in my prayers. We all know that Saorise Craig is shinning in heaven. I am truly sorry to hear of your loss. I will pray for you and your family! Saorise was an inspiration for all! I am so sorry to hear about your loss. I've followed your story like so many others after I found it on CNN. Cancer has been a theme in my family. My sister was recently diagnosed with thyroid cancer. Your daughter fought hard, but so did you. You fought hard for the both of you. No words can ever express how you feel, there's nothing anyone can say that could ever measure up. She knew that she was loved, after everything you've been through together, that was the best thing that you did for her. Just love her. Many prayers for you, and millions that have love for you too. I am so sorry for your loss. My heart breaks for your family. I pray for strength and peace as you begin the next phase. Words cannot express my deep sorrow for your family at this time. You are wonderful parents and the love you have just shines in so many ways. I am so deeply sorry. I am just a stranger who has been following your blog for the past several months, hoping for a miracle for your sweet little baby. This news took my breath away and left tears streaming down my face. Please know that your beautiful little girl and her very brave battle have made such an impact on me--I will never take anything for granted or wish any moment of my life away. My thoughts and prayers are with you and your family. My heart aches for you and your family. My prayers are with you. May God hold you close and comfort you as only He can. I am so sorry for your loss. You and your family are in my thoughts this holiday. I am so sorry for the loss of your beautiful baby girl. She has touched so many lives but I'm so sorry she had to suffer and leave you much too early. I am truly sorry for you and your family. My heart is breaking for you. Your blog has touched me in so many ways. You and your little girl have reminded me how precious life is. I am praying that you and your family find the strength to get through this. May little Saoirse finally rest in peace. So, so sorry. There are no words. I join everyone else in my hopes and prayers that you have courage and stength to face this tragic reality and one day find the peace that you so deserve. Your family has made a real, important difference for mine. Thank you, Saiorse, Kezia, and Mike. I'm so sorry to hear about this... my wife just told me. I know it isn't much consolation but I am thinking of your family and will wear mismatched socks in honor of Saoirse tomorrow. I wish you the strength to make it through these tough times as a couple. Good luck and God bless. I am so sorry for your loss. Your story has touched so many hearts including mine. I know that tonight is very difficult, and that tomorrow morning will be as well. I'm so sorry for that. I wish you, and especially Saoirse, hadn't been chosen for this particular journey. I wish neuroblastoma awareness didn't fall on your shoulders, and cost her her life. But she is such a unique soul...one that could break through hearts all over the world and touch them in a personal way. ...Making them feel like they too had lost someone they loved. Only she could have done that. And only that will motivate people. For her, and you, I wish it weren't so, but she was just that special. It is because of her beautiful personality, together with her terrible journey, that something is happening that has never happened before. People are heartbroken, outraged, angry. Ready to do something and fight (and aready doing so), finally, because of your beautiful funny little girl and your amazing courage in sharing the journey. Right now, though, none of that matters I know. I wish this hadn't happened to you, that you didn't have to find a way to be 'courageous', that you didn't feel so absolutely empty and lost. Talk to her, she will hear you. And when it is just right, you will feel her. Though I know tonight and tomorrow will be hard, I hope even just briefly that you can feel that it has now been one whole week that she has been living in her 'dream' and has had not one moment of pain or discomfort, and is unaware that she has left you. Because she hasn't, from her perspective. I believe that her soul has spent the past week in this 'dream' with yours, in absolutely no pain, giggling and playing with you, giving you kisses, being goofy, and just being so happy. Tuesday morning marks one week of indescribable pain for you, but it is one week that she has had no pain, for a whole week, and her spirit just got to be free with you. She will be your baby girl forever. Smile for her through your tears. I am truly so very sorry. It isn't the same, but I just lost my mom after a four month battle with glioblastoma. I do know the heartbreak of losing a loved one, but not a child. my thoughts and prayers are with you. I am so sorry for your loss and cannot imagine how hard this is for you and your family. Thank you for sharing your little girl with us. I'm soooo sorry for your losss...I have been following your blog since I saw it on CNN...hope your beautiful little girl is at peace! I have been following your blog often... I was so sad to hear of her homegoing, but rejoice she is at peace, not suffering anymore. She is an angel now -- maybe wearing mismatched wings with socks. :) I will continue to pray for you and your family during this time. I have followed your story on CNN for the past few months and I just want you to know that my thoughts and prayers are with you. Your daughter is just beautiful and her smile and your story touched my heart numerous times. Though she is gone her smile and your courage will live on in my memory forever. So, so sorry for your loss. I will hug my little Sunny Saoirse tighter each day in your daughter's memory. I am so sorry for your loss! Your daughter's bravery and courage at such a young age is truly an inspiration. You and your family are in my prayers! We have been following your courageous family's battle from The Jackson Laboratory in Bar Harbor, Maine. Children like Saoirse are the reason we come to work everyday - to find answers - treatment and cures. Our hearts go out to you. God bless you and your family. I had seen some of your story on CNN as well and my heart is breaking for all of you at this moment. Just saw this story on CNN. Praying for your family as you move through the holiday season. So very, very sorry for your loss. Another death caused by "early diagnosis" followed by unnecessary and extremely aggressive treatments: chemo and surgery. Neuroblastoma is benign, it goes unnoticed in many children and disappears by itself. This child is another sad case of "death by doctor". To her mum: chemo will kill you too, cancer is nothing compared to the deadly poisons you're happily swallowing. I have been following your story on CNN, I am so sorry for your loss. "Another death caused by "early diagnosis" followed by unnecessary and extremely aggressive treatments: chemo and surgery. To her mum: chemo will kill you too, cancer is nothing compared to the deadly poisons you're happily swallowing. " YOU HAVE NO IDEA what you are talking about. First off there was NO EARLY DIAGNOSIS and NOT ALL neuroblastoma is benign. Are you kidding me ??!!! Read her story, read all the others stories too. You should be ashamed for even posting what you did. Do you know how many people would be dead if they didn't fight and endure chemo etc. ?? Think about the millions diagnosed with breast cancer- of they just took it and decided not to fight. I hope you never have to deal with the pain the Fitzgeralds have. It is obvious to me you need to do much more research. I'm so sorry for your terrible loss. Sending love and light. I'm just so sorry.